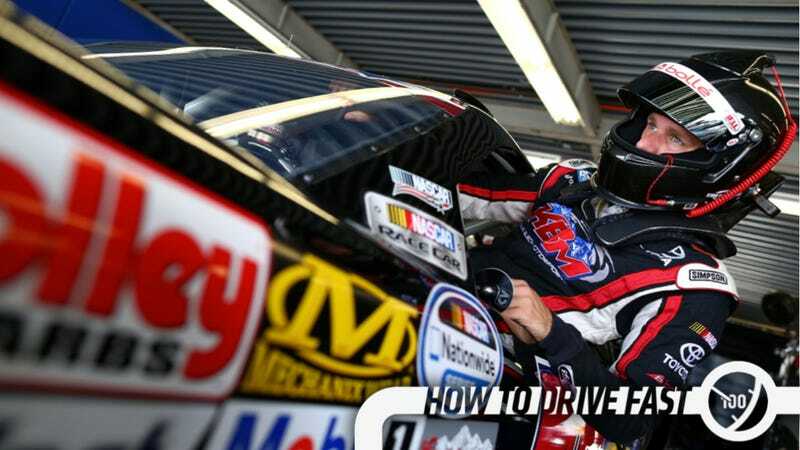 Every relationship starts with an introduction, so here it goes: My name is Parker Kligerman and I am 23-year-old professional NASCAR driver for Kyle Busch Motorsports in the NASCAR Nationwide Series. I've been paid to drive race cars since I was 18 years old when a small check arrived at my door with the unassuming name “Penske Racing” above the letterhead. The check has been framed above my bed at my parents' house in Connecticut ever since. As for my racing history – to make a long story short – I raced Go-karts for 2.5 years at a small club named Norwalk Karting Association that was located in the parking lot of a beach with a course made out of cones. I won a lot of races, but failed to win the championship. I decided at the old age of 15 that Michael Schumacher needed to be stopped immediately and that I needed to start driving race cars in order to end his reign of supremacy. After many family fights between me, my Dad (he did not like racing) and my Mom, I was allowed to race a car at Lime Rock in Skip Barber. I started the race fourth in a torrential downpour, had the lead by Lap 2 and lapped the most of the field. I then raced on the West coast in the illustrious but now defunct Formula TR Series where I won a lot of races and finished second in the ones I didn’t win. I skipped some races, but still won the championship. Sadly though, this was the end of my plans to sneak up and wrestle the F1 world championship from Michael Schumacher and his foe Fernando Alonso. The simple reason was that I had no money. My dad had only begrudgingly helped me during my Go-Kart years and one year of racing in cars. I was on my own. Realizing that the only place to actually get paid for driving fast, I decided that my new arch-enemies were all the drivers in what is now the NASCAR Sprint Cup Series! With the help of a great friend and no money, I made my way to Indiana to drive a USAC Midget because that was where you became a NASCAR driver (it worked for Jeff Gordon). We failed miserably in 2007, but in 2008 we won a lot of poles, set a track record, developed the Ilmor Engineering midget engine and won a race. Ryan Newman left Penske Racing and they started a development program. To top it all off, Roger Penske owned part of Ilmor Engineering, Inc., and my name was on the list of potential drivers. I met a very generous man, who will remain nameless for reasons of fame, while attending an ARCA race and was granted an opportunity to drive an ARCA race car. I qualified second and finished sixth in the race. Later that year, I signed with Penske Racing and, in 2009, we won nine out of 21 races in the ARCA Re/Max Series, but, as you might have guessed, we didn’t win the championship. I was given the opportunity to start first race in NASCAR’s second tier series only two years after deciding that this would be my path to the top. I won the pole by beating Kyle Busch and finished 16th on the lead lap. Not bad. Almost four years later, I have driven for two years in the NASCAR Camping World Truck Series. I drove 1.5 years for the reigning NASCAR Sprint Cup Series champion’s team Brad Keselowski Racing. After I left BKR (it’s a long story), I drove one of Red Horse Racing’s Toyotas in which I won my first race in one of NASCAR’s national series at Talladega. I finished fifth in the final standings. Now I find myself toward the end of my first full season in the NASCAR Nationwide Series driving the No. 77 Toyota Camry for Kyle Busch Motorsports, currently sitting 10th in the standings. So why the intro? Well after a tweet in which I probably wrote slightly inebriated, pronouncing my love for the site Jalopnik, I have been asked to write a little something once every 2 weeks for all 5 people including my mom that will read this. This brings me to my title. If you’re a fan of NASCAR or of any motorsport, you often hear the phrases “it just won’t turn,” “it’s really loose,” “it’s so tight, I couldn’t turn in a 1,000-acre field” or my personal favorite “it’s so loose I can’t drive it.” Why is the last one my favorite? It’s because the driver almost always ends up continuing to drive the race car. So okay, yeah, these phrases might be more NASCAR than F1, but you get the point. The one thing both motorsports organizations have in common is that they are both describing a race car’s handling. Since the onset of the automobile, a car’s handling has been studied and has perplexed even the most intelligent scientists and engineers, while rewarding some of man’s most simple people with their voodoo analogies of what’s really happening when a car tries to round a corner. Ever since Mr. Benz created a three-wheeled vehicle with the steering wheel in the front only to realize that four wheels would add more stability and less-terrifying antics when entering a corner, we as drivers, designers and engineers have tried to find ways to make cars go around corners as fast as possible. In NASCAR, we spend millions of dollars trying to re-engineer the same suspension setup for 25 years. We also spend millions on trying to find every bit of downforce and “side force” (I’ll talk about this one later in the year) available in a race car that could potentially fail inspection if it’s a hundredth or even a thousandth of an inch off. This practice isn’t only found in NASCAR, this is common in all motorsports throughout the world. Billions of dollars are being spent on finding new ways to make a car go through a corner as fast as possible. This reminds me of a recent experience I had at the wheel of a compact car, whose name I would rather forget and whose manufacturer was not Toyota. You may notice my affection for Toyotas and, of course, this has nothing to do with their support of my race team or career. With that said, my experience was one of absolute terror, mental anguish and physical depletion. Yes, these might be extreme words for a simple rental car adventure that lasted four hours when you drive close to 200 mph every weekend. It simply isn’t, because this car lacked the one basic element that is a necessity in successfully traveling from point “A” to point “B.” This car has haunted me ever since because it could not drive straight! It took every ounce of my driving skill (or lack thereof) to achieve a steady forward trajectory. I endured many near-misses and close calls where I came close to re-enacting The Fast and The Furious scene where the car passes under numerous semis on the road. I’m pretty sure if I had done this it would have led to certain death. I pulled over at a rest stop and decided the something had to be wrong. To my surprise and horror my untrained eye was unable to find anything wrong with the car. I decided I wanted to get home; therefore, my only option was to focus as hard as I could on the one thing that most of us don’t focus on while on the road – driving. It occurred to me that I would not have any extra brain capacity left over for texting, posting on FaceSpace or on my personal favorite: the twitter. I was a focused, fully devoted driver and nothing was going to break my concentration, other than my rapidly approaching death. This brings me back to the term “handling.” Our industry has spent billions on developing better car handling for our cars on the race track and subsequently applying this to passenger cars. We have found ourselves in a truly unenviable position. Driving is too easy. It was a revelation I had when I owned a motorcycle for one day before the statistics of people texting and driving and the subsequent rider deaths forced the people closest to me to convince me not to ride my new beautiful iron steed. It occurred to me that to hinder this texting and driving phenomenon we have to stop worrying about a car’s handling and focus more on how to engage the driver in the car’s handling. Of course I am not saying to make it so hard that we have pimpled-face teenagers (or 23-year-olds in my case) driving into living rooms and pizza parlors. Instead, perhaps we need to take a page from NASCAR and put the driving back in the drivers’ hands. You never know when a bout of challenging handling, less money allocated to “improving” a car’s handling and more money spent on involving the best computer of all – the human brain – might just a person’s life.